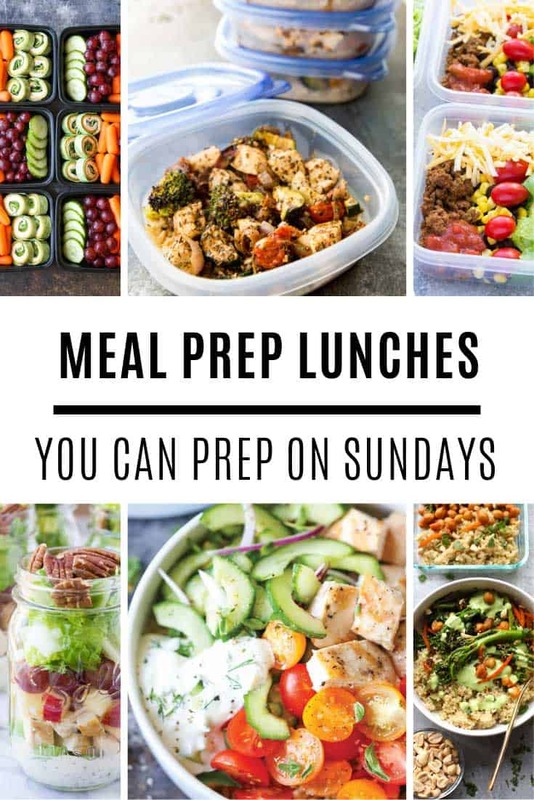 Forget about expensive lunches – these healthy meal prep lunch ideas will save you time and money and are so much healthier too! 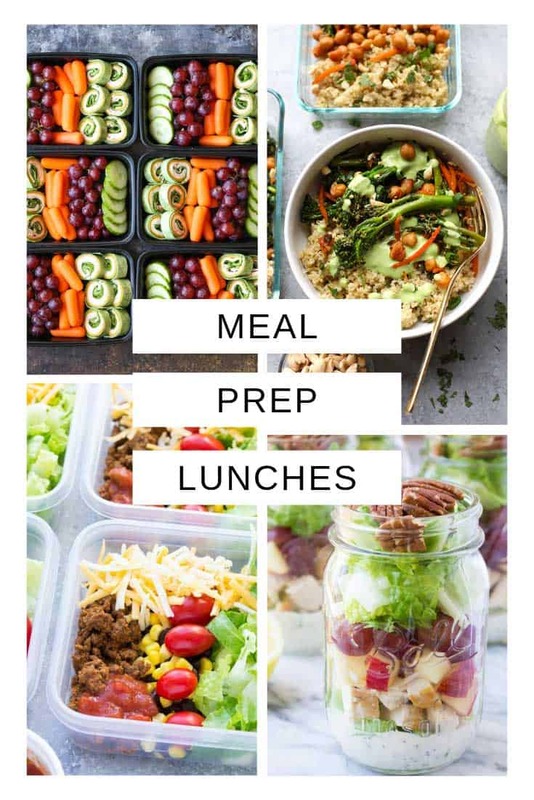 If you eat out at lunch time you can save yourself a stash of cash as well as improving your diet by meal prepping your lunch instead. 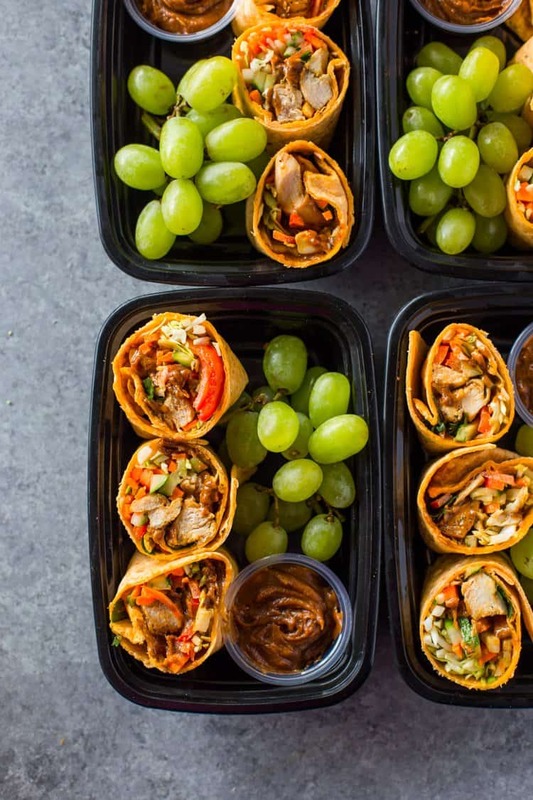 Here’s our pick of the best meal prep lunch ideas from around the web to get you started! And a top tip for you, most of these recipes make four portions to see you through Thursday, if you know you’ll get bored eating the same lunch every day then pick out two with common ingredients so you can mix and match instead. While you’re here don’t miss our collection of delicious meal prep sandwiches too! 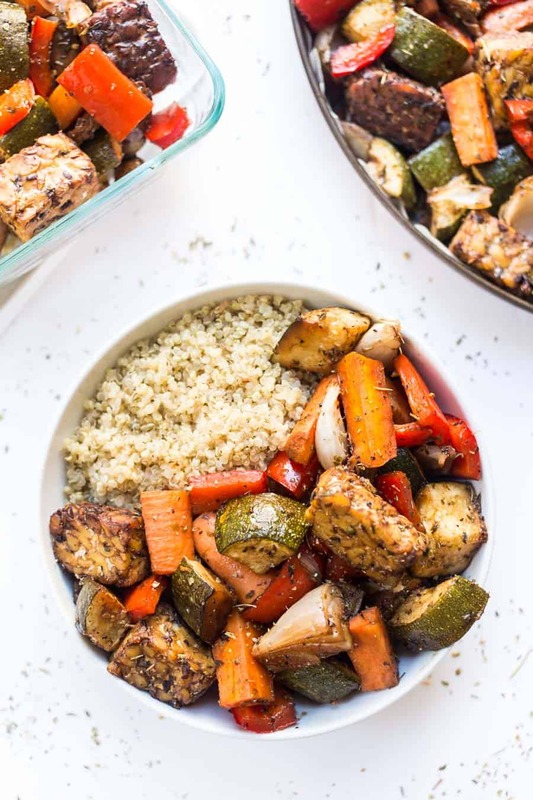 This delicious meal prep lunch option is packed full of yummy veggies and seasoned with classic Italian spices. It’s SUPER easy to make so a good option to try if you have just started meal prepping. 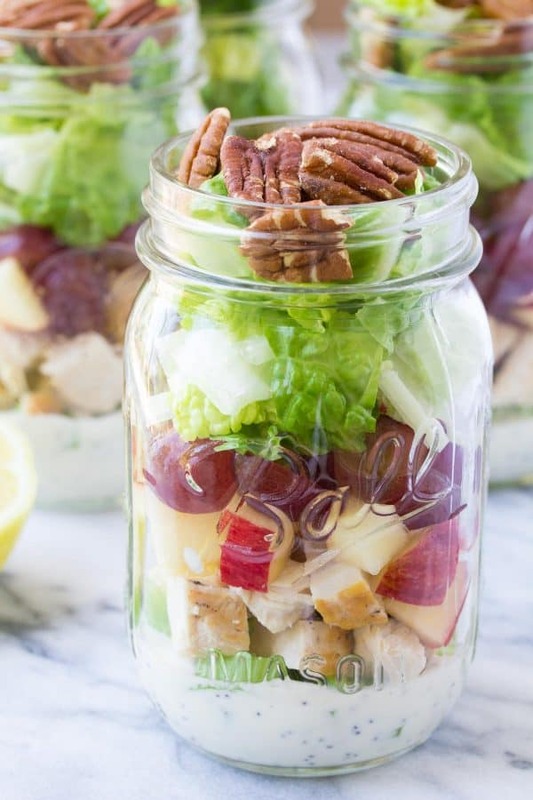 Some say that you haven’t really meal prepped until you’ve tried your hand at a mason jar salad or two! This one combines chicken with apples and grapes and is topped with leafy greens. Here’s a mason jar meal prep tip, if you LOVE lettuce then make sure you use 32oz wide mouth jars to make sure you can fit it all in! If you need some 32 oz Mason Jars you can find some here. Not sure which containers you need? 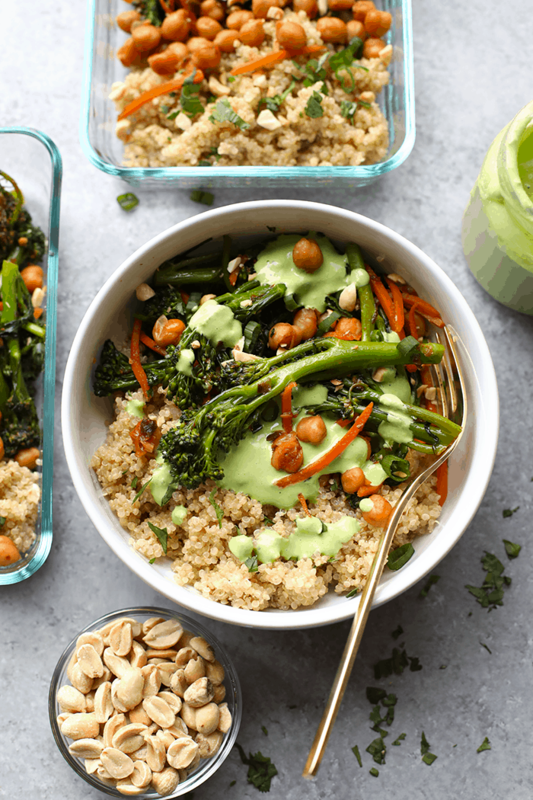 Quinoa is a great alternative to rice and pasta and can be dressed up in so many different ways you could eat it for lunch all week and still have a different meal every day. 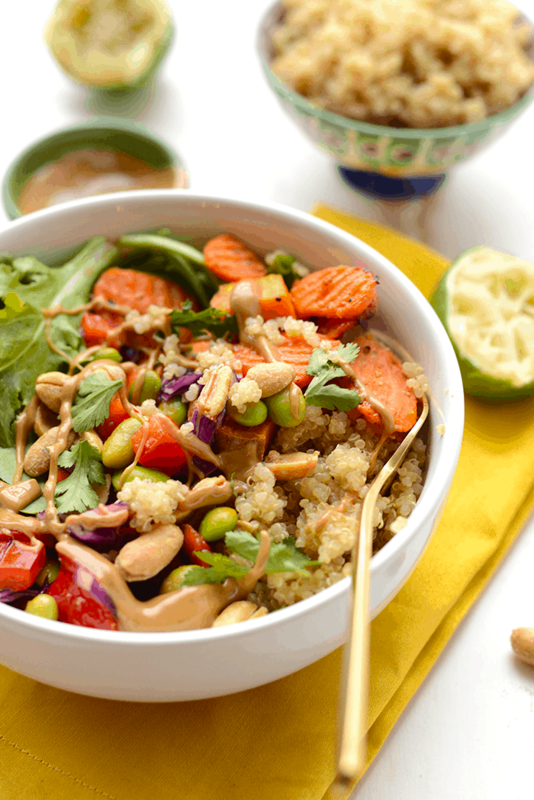 This buddha bowl recipe looks totally delicious and could easily be eaten at home or at work. Case in point. 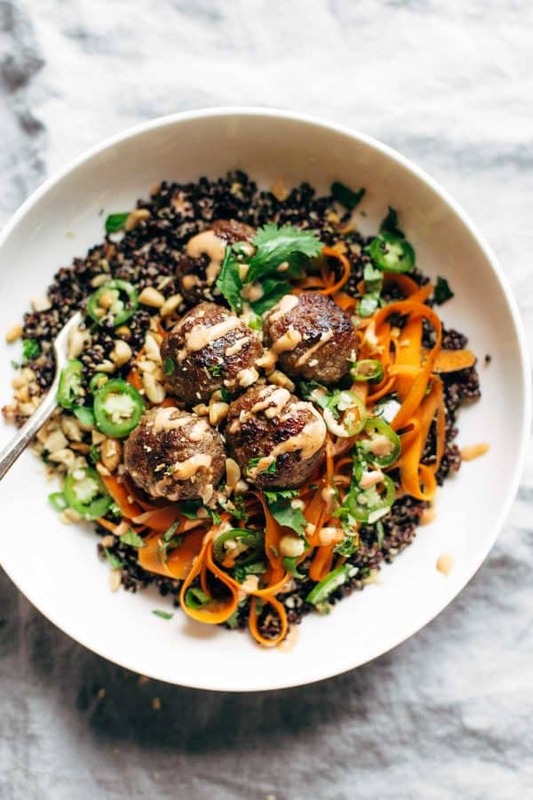 Here’s another quinoa based lunch bowl recipe that’s totally different to the one that came before it! 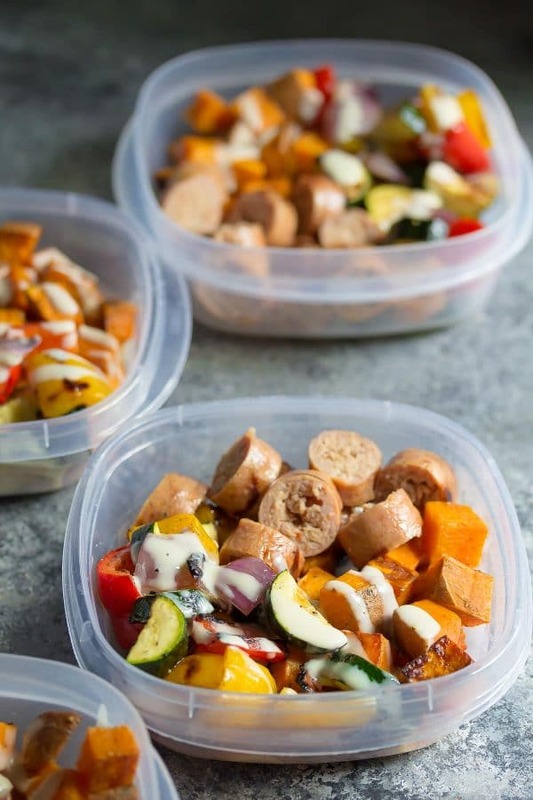 If sausage is your thing then you are going to LOVE these sausage and sweet potato lunch bowls. Add in some mixed veggies and you have a wholesome meal to keep you going through that afternoon slump! If you love sandwiches (or you have kids to meal prep for) then check out these yummy pinwheels. They’re super easy to prepare so a great choice for a weekend when you can’t fit in your full meal prep session. 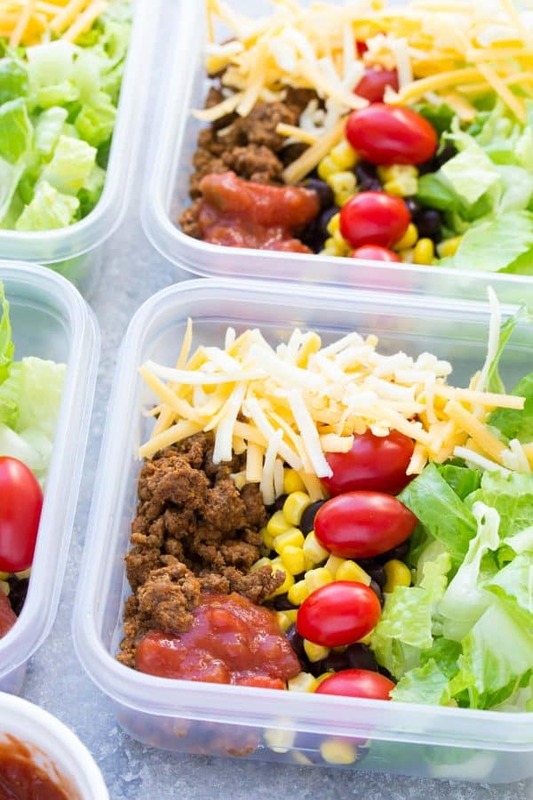 These yummy taco bowls are filled with taco beef, cheese, lettuce, black beans and corn and topped with salsa! How about the taste of Greece to liven up your lunches this week? 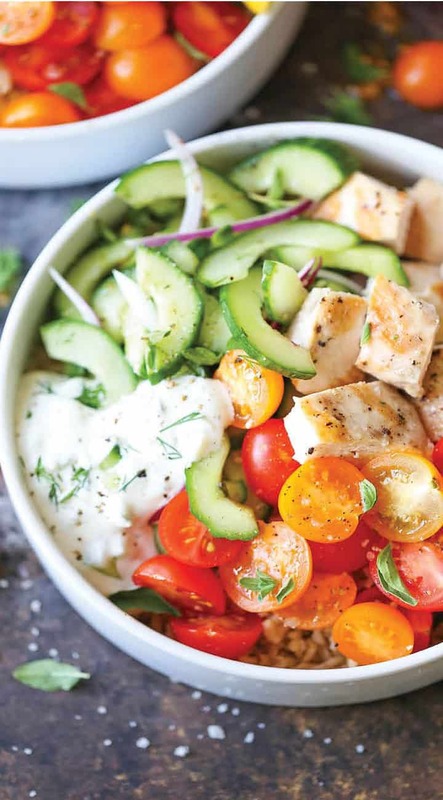 The Greek yoghurt tzatziki sauce is packed full of protein and probiotics to help look after your tummy. 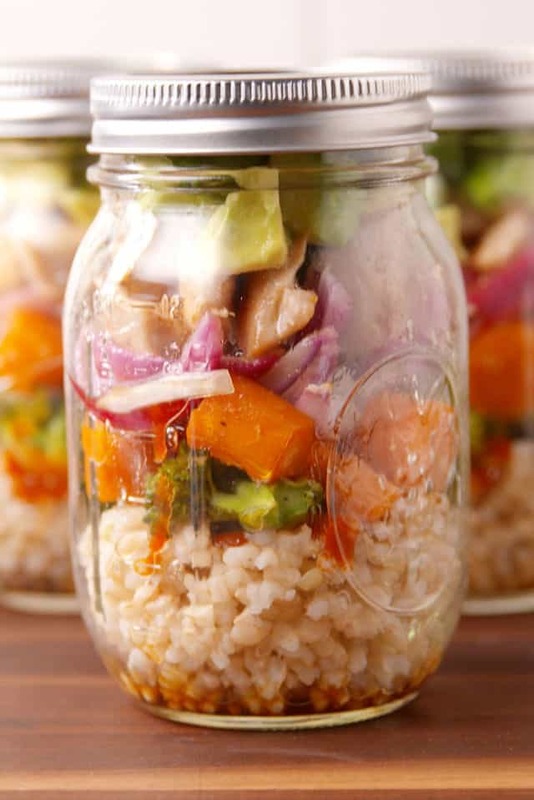 Don’t restrict your mason jars to just salad, because they’re a great way to make a portable Buddha lunch too! If you’re looking for vegetarian lunches check this one out. It’s packed full of the tastes of Thailand and the protein comes from the sweet potato and peanut butter. Here’s another Thai lunch option, but this one is packed inside a delicious Starbucks-style wrap. Of course this meal prep version is a fraction of the cost and much more healthy! For the ultimate in meal prep multi-tasking you have to learn to love sheet pan meals, just like this delicious “eat the rainbow” lunch bowl! 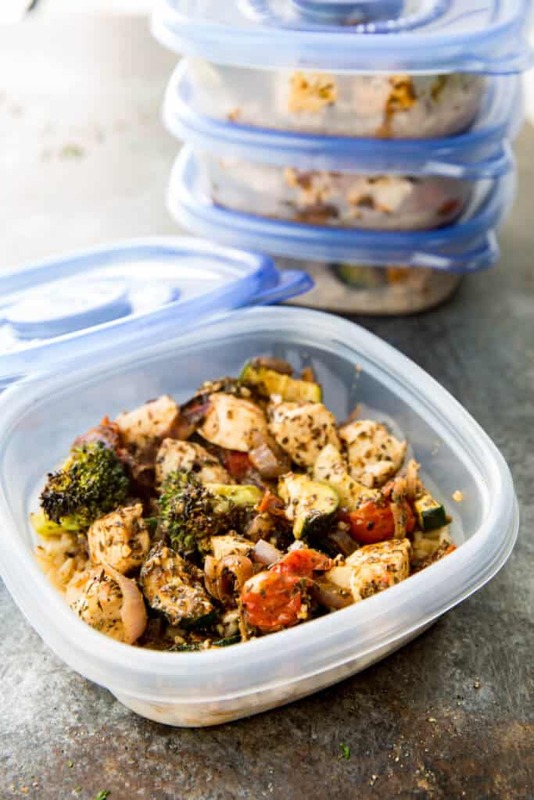 It takes time and effort to prepare your lunches ahead of time so make sure they actually last all week by investing in a decent set of storage containers. These 32oz Bento Box style glass containers are the perfect example. 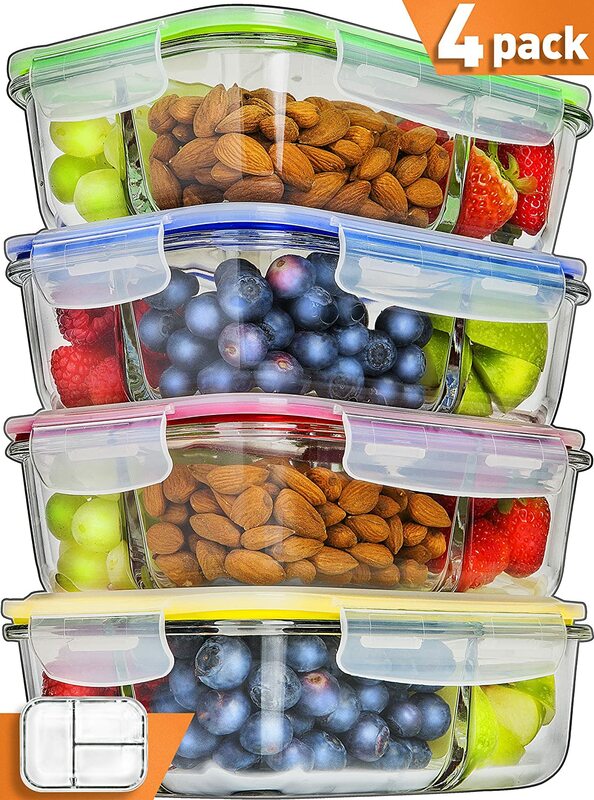 They have three compartments (each holding just over 1.5 cups) which is useful for determining portion sizes, they’re durable as well as being safe to use in the freezer and the microwave. They stack nicely and the thing I like the most is that they are different colors which is perfect if you’re meal prepping for your family as everyone will know which lunch is theirs! 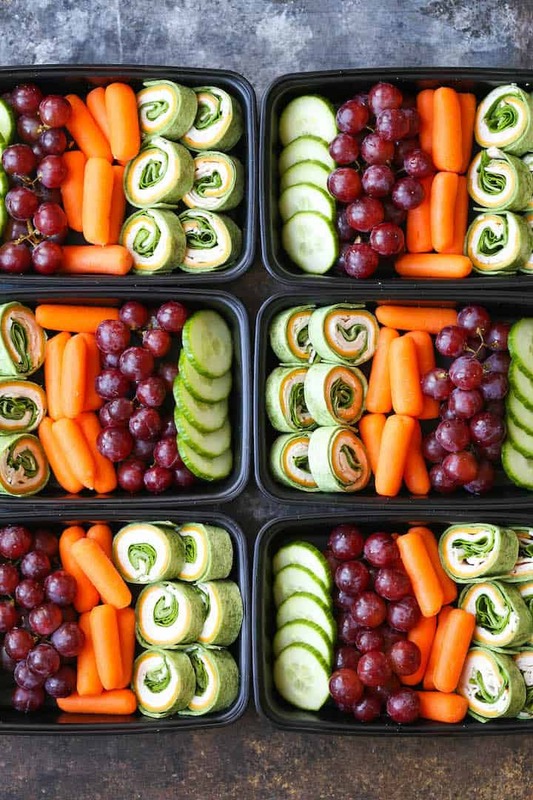 If you like to mix up your lunch time menu you could assign a different color to a day of the week too. 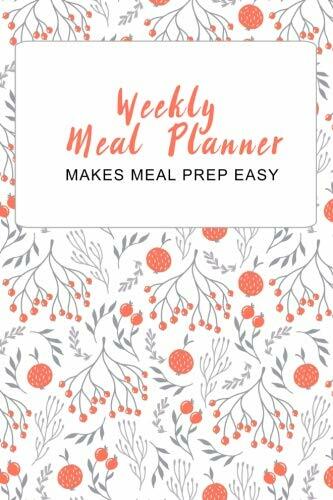 Meal prepping requires a little organization so why not get off to a strong start with this gorgeous Meal Prep Planner! Inside there is room to plan out your weekly breakfast, lunch and dinner meals for a whole year, as well as space to jot down the things you need to buy from the store. The planner is 6×9 inches so it’s the perfect size to drop in your purse and take with you when you go shopping. There’s room in the back to keep track of your goto recipes so they’re always right there in your planner when you need them.